What role does soil type play in sulfur availability to alfalfa? Research studies in recent years have shown that sulfur (S) may be deficient in some parts of Wisconsin. Sulfur deficiencies are most likely to occur when high S-demanding crops such as alfalfa, canola, or forage brassicas are grown on sandy soils or on other soils that are low in organic matter, far from urbanized areas, or have not received manure within the last 2 years. Several factors affect S availability to crops: soil organic matter, clay content, pH, atmospheric deposition of sulfate, and history of manure application. Soil organic matter contains approximately 0.56% total S, and about 2.5% of this becomes available annually. This translates to 2.8 lb S/a per 1% organic matter in the plow layer. On loamy soils in Wisconsin, soil organic matter will supply less than half of th S removed in an alfalfa crop. Sulfate (SO4) in soil solution can be leached into the subsoil, but it does not leach as readily as nitrate. Sulfate can also be held on soil clays, with more SO4 being held at lower soil pH. In general, sandy, low-organic matter soils have a greater probability of being S-deficient than higher organic matter silt loams. 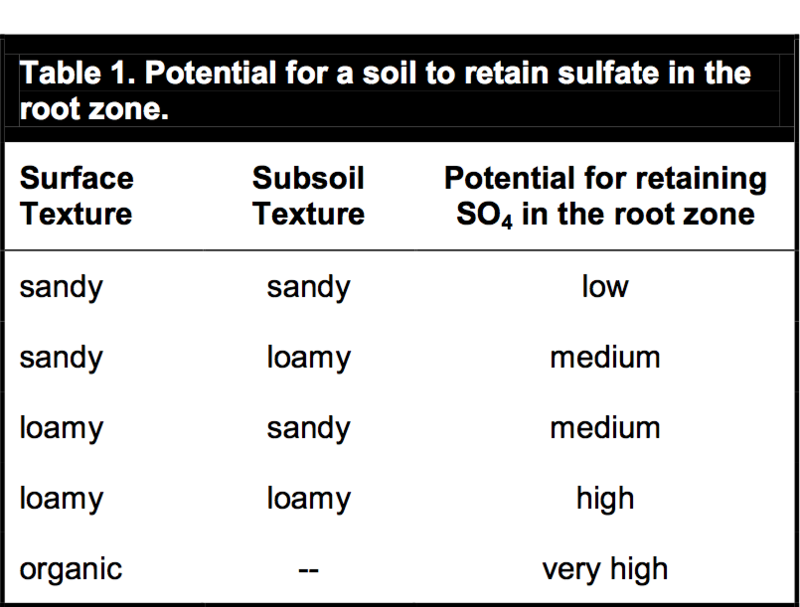 Table 1 provides some guidance on a soil’s relative ability to hold SO4 within the crop root zone. How much sulfur comes from precipitation and manure applications? The atmospheric deposition of S to Wisconsin fields has decreased dramatically over the past few decades and is approximately one-third of the level found 30 years ago. The annual deposition ranges from 3 to 10 lb S/a, with higher concentrations in southeast Wisconsin and lower concentrations in northwest Wisconsin. As a result of these large reductions in S deposition, S deficiency is becoming more common on loamy soils, particularly in alfalfa fields. Sulfur deficiency is not often seen on fields with a recent history of manure application. Manure S is mineralized in a similar manner to organic nitrogen in manure. Dairy manure will supply approximately 1 lb/ton or 1 lb/1,000 gal of crop-available S in the first year of application. What guidelines exist for determining when sulfur application may be needed? If the potential for a soil to retain SO4 (Table 1) is low or medium and no manure has been applied in the past two years, a S application will most likely be needed for crops with a high relative need for S such as alfalfa. Sulfur application guidelines for alfalfa are provided in Table 2. If the soil is organic or if a significant amount of manure was recently applied, a profitable yield response to applied fertilizer S is unlikely. For most other soil and cropping conditions, verify the need for S using tissue testing while considering the relative S need of the crop to be grown. Is tissue testing a viable option for alfalfa? The advantage of a tissue sample, and an accompanying soil sample, is that this technique measures that impact of all sources of plant-available S by measuring what is actually getting taken up by the plant. A plant tissue survey of alfalfa field conducted in 2010- 2011 (Laboski, 2012) showed that 62% of the fields sampled were low in sulfur (<0.25%). This is a large increase from a survey conducted about ten years earlier (Kelling, et. al. 2002) which showed that just over one-third of all samples indicated that alfalfa S levels were <0.25%. What form should be used and how often should sulfur be applied? All SO4 forms of fertilizer are equally effective when surface-applied or incorporated. Elemental S, however, is insoluble and must be transformed into sulfate-sulfur by soil bacteria before plants can use it. The rate of this transformation depends on particle size, degree of mixing with the soil, and soil temperature. To be effective, elemental S should be worked into the soil well in advance of the time the crop needs it. Without mechanical incorporation, elemental S is incorporated to some extent by falling into cracks when the soil dries or by the activity of earthworms and burrowing insects. Crops such as alfalfa and corn silage can remove large amounts of S in one season. If alfalfa will be grown on soils needing S, either elemental S or SO4 forms such as potassium sulfate, ammonium sulfate, potassium-magnesium sulfate, or calcium sulfate (gypsum) can be used. If the soil is known to be deficient in S, include some sulfate-sulfur in topdress applications for immediate S availability. When applied at recommended rates, sulfate-sulfur will generally last for two or more years, while elemental S should last for the term of the stand. Sandy soils may require annual applications of SO4 forms of S because the SO4 leaches through these soils more rapidly than loamy soils. Irrigation water, however, may contain sufficient sulfate-sulfur for the crop. In these cases, response to fertilizer S is likely only in years with above-average rainfall, when little irrigation water is applied. Additional information on sulfur is available in UW-Extension publication Understanding Plant Nutrients: Soil and Applied Sulfur (A2525). Kelling, K. A., P. E. Speth, and S. van Wychen. 2002. Sulfur responses and the Wisconsin alfalfa sulfur survey. New Horizons in Soil Science, #13-2002. Department of Soil Science, University of Wisconsin-Madison. Laboski, C.A.M. 2012. What do Recent Plant Tissue Analysis Surveys in Soybean and Alfalfa Tell Us? Proceedings of the 42nd Soil Fertility Extension-Industry Conference. Des Moines, IA. Laboski, C.A.M. and J.B. Peters. 2012. Nutrient Application Guidelines for Field, Vegetable, and Fruit Crops in Wisconsin. University of Wisconsin-Extension Publication A2809. Cooperative Extension Publishing. Madison, WI.